Do you find yourself spending too much energy on what you don’t have, don’t do, and who you’re not? Spend time in reflection on cultivating a grateful heart. Reflect on the ‘never enough’ syndrome and begin embracing your being as opposed to your doing. Be open to the beauty of God’s grace in the most ordinary of moments so you can be ready to experience gratitude in times of stress. This will be a grace-filled retreat that will help you believe you are enough. You'll receive three reflection emails a week with the opportunity to share with others in a safe and encouraging environment. Each reflection should take about 20 minutes to read and share. Join us for a loving, welcoming environment that will inspire you to live a life that allows for God’s grace and is rich with gratitude. Retreat scholarships available by emailing Christine. How does an online retreat work? You'll receive an email reflection every Monday, Wednesday, and Friday morning. Each email will have a reflection and chance to share with others in a supportive and encouraging environment. The retreat is self-paced and lasts four weeks. Do you have to be tech-savvy? We've had participants of all ages and tech abilities and most have found it to be easy to participate. If you feel comfortable opening an email and clicking on a link, you'll feel comfortable with the online retreat. We're always available for immediate help. I'm Busy. How much time will it take? 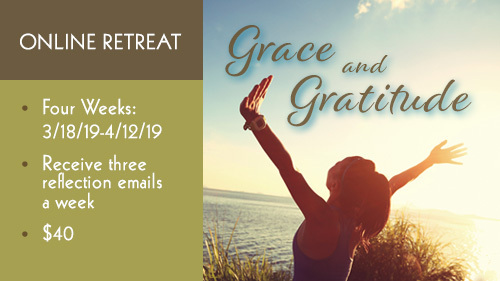 You'll receive three emails a week and you can expect about 20 minutes of reflection and sharing time per email for this retreat. The beauty of an online retreat is that you can reflect and share online whenever it's convenient for you: in your pajamas at 5 AM, on your phone during your lunch hour, or with your iPad while lying on the couch late at night. You can spread it out and reflect a little each day or save it all up for a special time on the weekend. It's all about convenience. It is self-paced and we keep it open for two weeks afterwards so you can catch up in case life gets busy. Is the online retreat different than the day retreat? Yes. The six-hour day retreats are on the same theme but they are presented differently. The big picture concepts will be the same but they will be explored in different ways and with different material. The beauty of an online retreat is that you're given four weeks to allow the concepts to build on one another and really take root and grow in a deeper way. The beauty of the day retreat is the opportunity to experience the concepts in a more experiential way - in your mind, body, and soul - through prayer, music, meditating with the scripture, and sharing. Both options are beautiful and unique in their own way. If you decide to register for both, you won't feel like you're experiencing the same retreat twice. I hesitated to sign up because I’m a senior citizen and I felt intimidated doing the retreat on the computer. When I finally decided to sign up, I was surprised how easy it was for me to participate. I was especially excited when I didn’t even have to ask my husband for help in using the computer because it was so people friendly. I even gained more self confidence in my computer skills. If I could do it then anyone can. Partial scholarship available by emailing Christine. PLEASE REGISTER BY WEDNESDAY, MARCH 13. New retreats are held every fall and spring and re-run in the summer. Your Balance, Your Peace will re-run June 17-July 12, Grace and Gratitude will re-run July 15-August 9.